With the upcoming Madigan-Cullerton budget deficit more than double that of last year, a mid-year solution is not a possibility this time. The Rauner Administration must immediately begin taking steps to manage state spending. While the Administration is committed to managing the Madigan-Cullerton budget responsibly, because their budget includes no reforms, the options available to the Administration are limited. Please visit The Caucus Blog to review the steps the Rauner Administration is initiating in order to begin balancing the phony Madigan-Cullerton budget. Many additional steps will be announced as they are finalized. After the majority Democrats passed budget bills for FY16 that are almost $4 billion out of balance, Speaker Madigan and Senate President Cullerton gaveled their respective chambers into recess and left town. By parliamentary maneuvers, called “motions to reconsider,” the Democrats stopped their flawed budget bills from being sent to Governor Rauner for final action. Insiders described this move as forestalling the vetoes that Governor Bruce Rauner would otherwise have issued. House Republican Leader Jim Durkin immediately labeled the Democrats’ budget bills a fake budget that points to the need for real reform. · House Republicans look for path forward. With House and Senate Democrats refusing to pass an honest, workable budget, the Illinois budget process has temporarily reached a point of impasse. Future deadlines will place ever-increasing pressure, throughout the summer, upon high-ranking policymakers to enter into serious negotiations. The State of Illinois is currently finishing up Fiscal Year 2015, which will end on June 30, 2015. The new fiscal year begins on the following day, July 1, 2015. After the end of the month, if any money is left over within any State line item, a two-month “lapse period” within the new fiscal year is created within which remaining FY15 funds can be spent. However, there will be very little lapse-period monies available for use this summer. The State’s first payroll deadline within the new fiscal year will come on July 15, 2015, so there will be intensifying pressure to reach a budget deal prior to this date. An additional deadline, if required, will come in mid-August. General State Aid (GSA) payments from the State to local school districts are due on August 10 and August 20, 2015. Few, if any, schools within Illinois will open for fall classes without the cash flow represented by these GSA payments. Some items within the State budget are protected by what is called “continuing appropriation” authority. Areas of spending or money transfer that are mandated by federal law or by existing contracts and bond indentures are areas where money will continue to flow even in the absence of a year-to-year budget. Examples include bonded debt service, certified pension payments, the Teachers’ Retirement Insurance Program, the College Insurance Program, income tax payments and sales tax payments shared with local governments, the TANF welfare program, the AABD aid to the aged program, and stipends paid to parents and guardians of adopted/process-of-adoption/guardianship children by the Department of Children and Family Services. At the same time, the City of Chicago faces a separate set of urgent budget pressures. Current law requires the City to make a $634 million “balloon” payment to the Chicago teachers’ pension fund no later than June 30, 2015. Furthermore, additional “balloon” payments to the pension funds that support retired Chicago police officers and firefighters will be due later in 2015. · Democrats attempt to kick Chicago’s pension troubles down the road. Once again, Chicago asked the Illinois General Assembly – and, indirectly, asked the taxpayers of Chicago and neighboring communities – for pension help. With junk-bond interest rates topping 5.8% and a deadline looming to make a mandatory $549 million payment to underfunded Chicago police/firefighter pension plans, the City advanced SB 777 to stretch out its payments to these funds. The mandatory 2015-16 police/fire payment would be reduced by the measure from $549 million to $330 million. House Republicans opposed SB 777, pointing out features in common with previous legislation from majority Democrats that kicked Chicago’s pension troubles down the road. One key feature of SB 777 was a provision that pre-commits future cash flow from a hypothetical future Chicago mega-casino to these police/firefighter pension payments. This placed the City of Chicago in an unusual situation, as it is expected to soon be asking, in presumptive good faith, for casino rights even though they will already have relinquished much of their financial incentive to get a positive response to their request. In addition, SB 777 could not be plausibly presented as a measure that “solves” Chicago’s pension crisis. The Chicago Public Schools (CPS) are required by a parallel law to make a $634 million contribution to the teachers’ pension fund that must be transferred no later than June 30. SB 777 was approved by the House on Saturday, May 30, on a vote of 65-45-2. The measure was returned to the Senate for a concurrence vote, but was then held up by a “Motion to Reconsider” filed by the office of Democratic Senate President Cullerton. · Concealed carry trailer bill approved by bipartisan majority in both houses. SB 836 responds to concerns raised by Illinois firearms owners and law enforcement. It creates a protocol to govern law enforcement or public safety stops of citizens, such as traffic stops, when the citizen is armed with a concealed firearm. The bill authorizes a citizen to move a concealable firearm from a concealed location on his or her person to the trunk of a car or truck, and vice versa. The measure clarifies that obeying the laws contained within the Concealed Carry Act shall protect a citizen from being cited or arrested for unlawful use of a weapon. SB 836 was supported by many lawmakers of both political parties. State Rep. Ed Sullivan, a chief co-sponsor, was the lead negotiator of SB 836 for the House Republicans. Approval by both houses cleared the pathway to send this measure to the Governor for his signature. · SB 1747 – Omnibus criminal law bill; cannabis. Yet more partisan shenanigans held up approval by the General Assembly of an omnibus criminal law update bill for spring 2015. SB 1747 had been extensively negotiated by representative from both sides, with participation from prosecutors and law enforcement officials. Unfortunately, the product of this participative process was not brought before the Illinois House for a vote. Instead, language was added to the measure to seal certain court records related to cannabis offenses from public disclosure. The additional language, which can be found on page 27 of House Amendment #5, created serious concerns for employers. In many cases, employers are bound by their contractual relationships with other businesses, and by the terms of their workers’ compensation liability insurance policies, to look closely at the status of their employees and contractors on issues like these. SB 1747 was re-referred to the House Rules Committee. · House Republicans support equal pay for women in the workplace. As the regularly scheduled spring legislative session came to a close, House Republicans backed legislation in the Illinois House in support of equal pay for equal work. State Rep. Terri Bryant Bryant joined her colleagues in support of an amended version of HB 3619. Bryant voted Yes to concur with changes made to the bill in the Illinois Senate. Bryant says the changes lowered the fines for first time offenses to reduce the burden on the smallest of small businesses. Bryant had argued that high first time fines proposed in the original bill were likely to drive more businesses, jobs, and population from the state. That type of outward migration is something Bryant says Illinois cannot afford. In addition to HB 3619, House Republicans supported an Equal Pay resolution sponsored by State Rep. David McSweeney. HR 442 states that the House strongly supports workplace equity and equality under the law covering pay and benefits for employees as established by the Equal Pay Act of 1963. The Sunday, May 31 deadline significantly governs actions taken by the General Assembly. Under Article IV, section 10 of the Constitution of Illinois, a bill must be acted upon before this date by both houses if it is to take immediate effect by simple majority. On June 1 and following, a bill – to be effective immediately – must win an extraordinary three-fifths majority in both houses. This gives a potential space at the table to members of the Illinois House and Senate minority party and to lawmakers from less-populated regions of Illinois. The Democrat-controlled Illinois General Assembly was less productive in 2015 than its predecessor had been in spring 2014. In the 2014 spring session, 511 bills were passed by both houses of the General Assembly – 268 House bills and 243 Senate bills. · General Assembly takes action to legalize happy hours in Illinois. Drink specials timed for certain hours of the business day and aimed at improving customer flow for taverns have been banned in Illinois since 1989. In spring 2015, the General Assembly enacted a bill to re-legalize happy hours for limited periods of time in a standard business day. Under SB 398, a licensed tavern will be allowed to offer drink discounts for no more than 15 hours a week and no more than four hours a day; furthermore, none of the hours can be after 10:00 p.m. The happy hours must be publicly advertised not less than one week in advance. The House vote on this bill, held on Thursday, May 28, was 82-31-2. The 1980s-era ban on “happy hours” was enacted in a time when authorities were fighting to reduce DUI violations and to enforce an increase in the legal drinking age from 18 to 21. With an additional generation of experience, public-safety experts have turned to new ways to reduce unwanted behavior. SB 398 includes a new mandate to impose training requirements upon employees and contractors of establishments licensed to pour alcohol. It is expected that this training will include online videos intended to help waitstaff learn more about signs that a customer has reached his or her legal limit of alcohol consumption. The General Assembly also passed a separate bill in spring 2015, SB 67, to ban the sale within Illinois of a newly-invented substance, dry powdered alcohol. This substance is in the process of being outlawed in Nevada, Ohio, Washington, and other states. Both SB 67 and SB 398 have passed both houses of the General Assembly and are currently waiting for final action by the Governor. · Compromise police bill passed by both houses. The measure includes provisions intended to sharply increase the number of body cameras (“bodycams”) worn by Illinois police officers as part of their uniforms. SB 1304 responds to concerns raised by Illinoisans and to requests made by police officers and management. House Republicans, especially Representatives Cabello and Anthony, were part of the negotiating team that worked out agreed language for this bipartisan bill. Police officers and management were interested in language that would allow police not to wear bodycams in specific situations where the devices would be inappropriate or unnecessarily dangerous. Increased training will be provided through the state-funded Police Training Board to inform current and future police officers on the appropriate use of bodycams and videos. As agreed by both houses, SB 1304 will require that a $5 supplement be added to all fines imposed upon convicted defendants in criminal and traffic cases. Monies from this supplemental fine will be granted to police forces seeking assistance in maximizing bodycam accessibility to the members of their force. A House vote of 107-3-4 signaled strong support for the agreement from both sides of the aisle. Passage of SB 1304 by both Houses cleared the way for the measure to be sent to Gov. Rauner for his signature. · Language discussed in Illinois House; real action elusive. Amendments to HB 1287, a Democratic bill, were debated in an extra session of the Illinois House held on Thursday, June 4. The bill was passed by partisan majority by a House vote of 63-39-4, sending this measure to the Senate for further action. Workers’ compensation had been one of the most partisan issues of the 2015 spring session, and hopes had been raised that a debate of this issue could lead to common ground between the two political parties in Springfield. 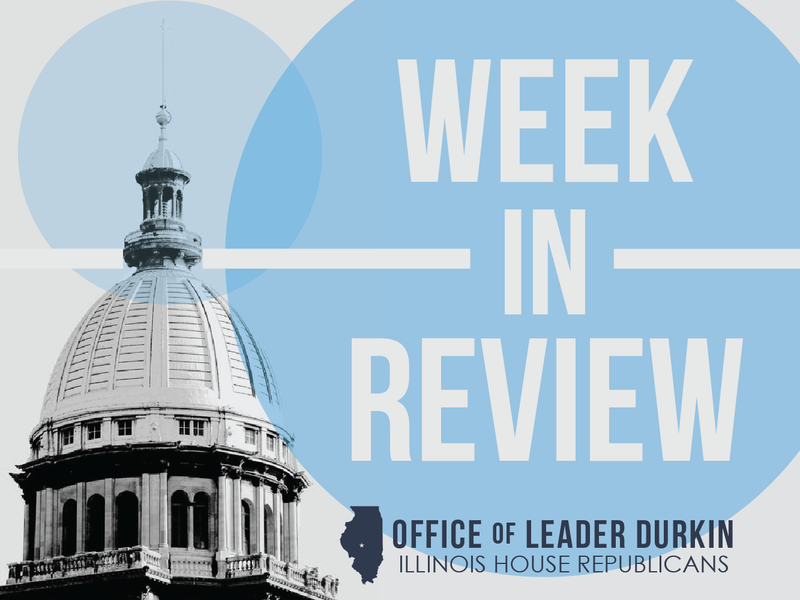 Unfortunately, the new language presented by the House Democratic leadership this week did not materially change their previous positions, and did not include the priorities publicly set by House Republicans and Governor Bruce Rauner. House Republicans voted unanimously against the partisan amendments added to HB 1287 by the Democrats. Insiders noted that the decision to hold a debate on workers’ compensation issues, even though the debate itself was sterile and did not generate compromises or agreed legislation, was a sign that there could be increasing pressure on the Democratic leadership to achieve demonstrable progress on this issue in Springfield. Illinois’ workers’ compensation costs are now the seventh-highest in the nation, much higher than comparable costs in neighboring states, and more than 300,000 manufacturing jobs have left Illinois in recent years. Experts on economic growth and job creation have pointed to workers’ compensation as a reason for the slow creation of new jobs and disappointing recovery from the 2008-10 economic downturn. · Illinois to consolidate its 9-1-1 system. Up until now, 9-1-1 systems have been operated by local public safety offices in cooperation with the telecom providers that offer services in each area. SB 96, enacted before the end of the May session by both houses of the General Assembly, will create a statewide 9-1-1 system that will fall under the authority of the Illinois State Police. A single fee level of 87 cents per line per month will be imposed on both wireline and wireless phones throughout Illinois other than Chicago, replacing the disparate 9-1-1 phone fees charged today. The local calling centers and emergency system boards will still operate on the local level, but SB 96 mandates a consolidation plan that will result in the closure of some of the smaller call centers. In a side agreement to the bill, older telecommunications firms such as AT & T were required to accept a continuation of the mandate that they provide “franchise” landline phone service to customers in designated service areas. Advocates for senior citizens played a major role in protecting the status of Illinois landline phone service. The Illinois House vote on Friday, May 29 to pass SB 96 was 94-15-2.